We’ve all been there. You’re laying in bed late at night or maybe you’re out with some friends or a significant other and all of a sudden you realize how disgusting your tongue feels and how bad your breath smells. In your mind, you picture your tongue as the surface of a pinkish-red planet with a thin layer of acid fog hovering over withered plants and animal carcasses. Only, the acid fog is actually a combination of black garlic pasta sauce and red wine from dinner. At that point, you can make one of two decisions; either clean your tongue using a tongue scraper, a toothbrush, or some mouthwash or go to bed risking that you’ll wake up in a world where no one would ever want to kiss you or face you while you speak again. You should probably clean your tongue. Scraping your tongue is done with a small plastic tool, accurately called a tongue scraper. It’s used to scrape from the back of the tongue to the front, which brings all that nastiness to a position where you can safely dispose of it in the bathroom sink. Using a toothbrush provides a similar experience, except with bristles instead of thin plastic. While both of these methods may feel like they work fine at the moment, there is something deeper at work than you might realize. Does bad breath come from the tongue? 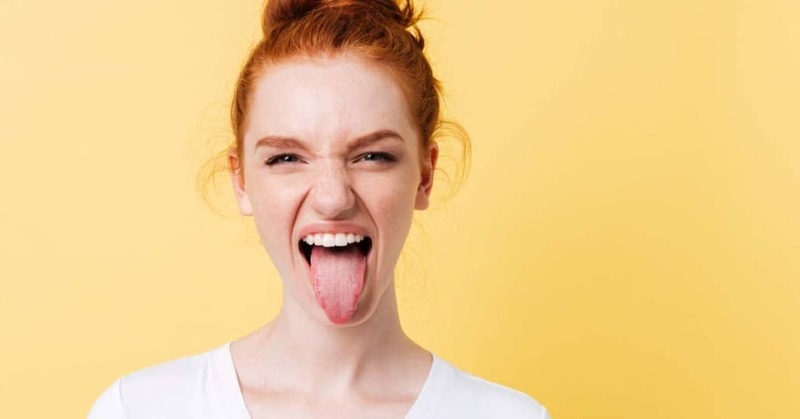 Besides removing a layer of rancid residue, does tongue scraping actually make your mouth cleaner or provide fresher breath? Bad breath, also known as halitosis, can be embarrassing and cause a lot of weird looks on the faces of people around you. Perhaps you’ve seen people with “scrunched up face” syndrome before. Or maybe you know someone who claims they “just have trouble looking at people when they talk”, yet you’re the only one they can’t seem to get over that particular problem with. Bad breath is a nuisance at best and a lifetime of “but, why?” sadness at worst. However, there is some good news: bad breath comes from a build-up of bacteria in the mouth causing the release of volatile sulfur compounds (or VSCs). Which sounds awful, so why is that good news? Because bacteria can be killed and your halitosis problem can be eliminated. Simply scraping your tongue isn’t going to do the trick. When using a tongue scraper, bacteria can come back almost immediately. And while using a toothbrush works better, (and according to dental professionals, we should continue to brush our tongues) it still leaves a lot to be desired when it comes to freshening breath or killing the bacteria that’s at work to wreck your social life. So, unless using a tongue scraper in public every five minutes suddenly becomes a popular trend, consider how to remove that sulfur smell completely. 80% of bad breath comes from a mixture of cavities, gum disease, cracked fillings, unclean dentures, or leftover food particles in your tonsils. Medical conditions can also cause bad breath. Such as diabetes, liver disease, respiratory tract infections, bronchitis, and even acid reflux. And while mouthwash certainly doesn’t fix broken teeth or cure medical conditions, it can provide some much-needed relief and improve social gatherings that include the regular opening and closing of a mouth. Every SmartMouth oral rinse prevents bad breath from returning for 12 hours per rinse. It is clinically developed by dentists to stop bad breath at its source by removing hidden bacteria and plaque buildup allowing you to get closer to the ones you love. Don’t just mask the problem of bad breath with tongue scrapers, eliminate it with SmartMouth Mouthwash.